After the Camp Fire—the deadliest and most destructive wildfire in California’s history—burned over 153,000 acres and took at least 88 lives in November, the little Northern California town of Nevada City (population: 3,136) came up with a plan. 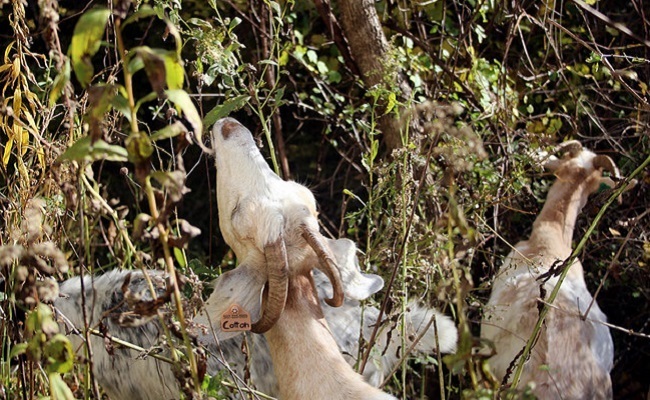 To clear 450 acres of fire-prone, city-owned vegetation, the city would rent goats to eat it. This fire safety measure is not at all unusual. There’s a term for it: “prescriptive grazing”. But there was one major problem: nearby ranchers had already rented out all their grazing goats for most of 2019. Goats were only available this winter, and there wouldn’t be time for Nevada City to receive a grant to pay for them. As a way to cover the cost in the interim, Senum launched a “Goat Fund Me” online campaign last month. Six weeks after the campaign started, it had raised over $16,000 of its $30,000 goal. “Our city staff, fire and police departments, as well as city council members realize how important it is that we take proactive steps NOW,” Senum wrote on the GoFundMe—er, Goat Fund Me—page. According to Senum, the cost to rent goats for prescriptive grazing can range from $500 to $1,000 per acre, depending on the terrain and amount of vegetation. Nevada City isn’t the only California town to use grazing goats to help prevent wildfires. Irvine used them last year, while Laguna Beach has been using them since 1991 to clear brush from the city’s canyons. Goats have also worked for this purpose in the San Francisco Bay area and the Santa Monica Mountains. As Nevada City officials discovered, the rental goat business has recently been booming in California, because of the now-frequent wildfires. “Once fire season starts, the phone never stops ringing,” Tony Gonzalez, a goat rancher in Lake County who’s already booked up for 2019, told Sierra Magazine. The frequency, intensity and behavior of fires “are dictated largely by type, condition, and quantity of vegetation,” according to the U.S. Fish and Wildlife Service (USFWS). Grazing can help fire-intolerant plant populations be replaced with fire-tolerant ones. “While traditional grazing management aims to manage the land to benefit livestock production, prescribed grazing manages livestock to benefit the land,” the USFWS says. Prescribed grazing may help make communities safer, but is it safe for the goats? The goats are accompanied by human handlers and dogs that shepherd them and help keep predators away. As I wrote last year, goats, unlike any other animals, have special enzymes in their saliva and guts that are able to detoxify many plants before they swallow or digest them. Poison ivy, for example, has no effect on them. They also avoid any plants that make them sick, and their human handlers usually check the grazing area first to make sure there’s nothing harmful for the goats to eat. It is nice to see a natural solution to a problem. Hoping the goats have many years of happy grazing.